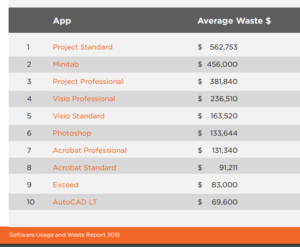 1E recently released their 2016 Software Usage and Waste Report. We thought it useful to highlight some salient points and relate it back to our experience in the South African context. Software license waste is prevalent in all organisations of all sizes and complexity. 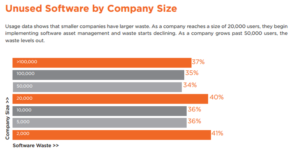 According to the report, the current tally of software license waste costs US companies $247 per user, or $28 billion. In South Africa we very similar unused profiles at our clients compared with that of 1E’s research. Conservatively one could expect an average of R2000 per PC of unused software. We define software license waste as an application that is deployed to a workstation but not used. 1E’s software usage and waste report is based on 149 companies, 16 industries, and 4.6 million users across the UK and the US. The report ignores license types and includes cloud subscriptions in its analysis of usage. What are the major software license waste culprits? The staggering numbers in the report were analysed over only 35 titles. Of these, 1E found the following were most prone to software license waste. This is similar to the profile we see in South Africa and the usual suspects are on this list. The common thread is that companies buy more licenses or subscriptions than needed. This is more prevalent for software that’s complicated and often built for specialists. For instance, most folks think they may want to use Camtasia Studio for film editing and then become overwhelmed. It is surprising how many of us are making movies these days! Adobe applications often fall into the same bucket often. For example, an application like Dreamweaver is used when building web sites. That is not a daily chore for most of us. Furthermore, you may subscribe to Creative Cloud for two or three applications, but you may install much more because you can. It’s like a buffet for software — you tend to consume too much but without the actual business need which just adds to unnecessary costs. If you have no visibility of usage across the enterprise, how can you make any decisions to get rid of it. 1E also calculated the costs of software waste for an average company with 30,000 machines. Here’s that tally from 1E’s report. Interestingly there is a light movement towards better efficiency in larger organisations but this is not absolute. Waste is prevalent irrespective of size. The takeaway from the report is that in many organisations, identifying and eliminating unused software is a significant untapped cost reduction opportunity.